"I already love it! I put my daughter in it and it must have been very comfortable because she was asleep within five minutes and continued to sleep for an hour in it! (This from my child that hates to nap!) I was thrilled. I will be sure to tell all of my mommy friends that it is a 'must have' item!" A number of years ago, an employer at an ice cream store in Santa Fe, N.M., told Nancie Swanke she was stuck in her dead-end job. And she started looking for another career option. Nancie started to develop her knack for sewing into a career, first doing alterations, then home interiors and upholstery projects. In 1995, a young father asked the custom seamstress to make him a child carrier. "I did not have a child at that time, and was not familiar with what was on the market for child wearing, but I was aware that people carry their child on their hip. I had been an older sister and a nanny for many years, so I know how heavy children can be." Soon after finishing the first few child carrier prototypes, Nancie began watching parents marvel over them. She sewed some Hemp carriers and added them to her line of Hemp and tapestry purses and bags she was selling at craft fairs. It wasn't long before the carriers became the main selling focus. "I took them on to bigger fairs and states fairs. I traveled to as many nearby cities and states as I could and dropped in on any small owner-run business that might potentially sell a child carrier. I wasn't always confident in what I was doing, but I pushed myself to be my best boss and make use of any motivated day I had." The Hip Hammock® was born. With a patent pending and orders coming in from around the country, Swanke quit her most recent day job to pursue her dream full time. "I've always been struck by the parent/child bonding," Swanke said. "When I see it, it inspires me. I wanted to find a way parents could easily carry their kids close and that inspiration gave birth to the Hip Hammock®. Parents can hold their children close, instead of at arm's length in a plastic container." As kids grow, the hammock becomes a seat that supports them. Swanke recommends it for children between 2 months and 3 years old. The design is simple: a triangular hammock attached to two adjustable straps. Using "adult" fabrics, including cordura, hemp, and woven tapestry, the hammocks are padded and lined with a soft fleece lining. "I wanted to make something a father wouldn't be embarrassed to wear. 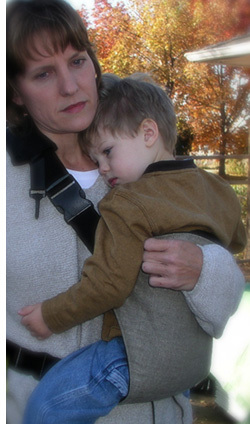 The 2" belts of the carrier are comfortable and look better on an adult's stature than the commonly used 1" strap." Swanke says. "Kids can be as cute as they want, but we don't have to look silly carrying them." When asked about the benefits of her child carrier compared to others, Swanke notes that most infants outgrow their front carriers by the time they are 15lbs. "It's too difficult to carry a child in a front carrying position, hanging from your upper back. I put a nice wide waist belt on my Hip Hammock to pick up over ½ of the child's weight and put them scooted them over to the hip. I also sewed a long thick pad to comfort the weight one felt on the should belt The design accomodates a child 15lbs and HEAVIER. I still carry my 2½ year old at 32 lbs when I need to contain him!"